While many Northerners think the South is known for hot summers and mild winters, we know how cold it can get in Buford, GA. After Snowpacolypse, many people are now taking their furnace maintenance more seriously. You don’t want to be stuck in your home without heating while the roads are too icy for driving. If you need furnace repair Buford GA, give your local friends a call at Cool Masters Heating and Air Conditioning. Despite the many benefits, some homeowners do not receive regular furnace tune-ups. Our maintenance programs will help your equipment work more efficiently, maintain your warranty and receive savings on other Cool Masters Buford HVAC services. If your energy bills have been higher than usual, your heating equipment could be to blame. Let us tune up your system today! Has your furnace stopped working? Is it making a strange noise? We are here to assist you with all your furnace repair Buford GA needs. 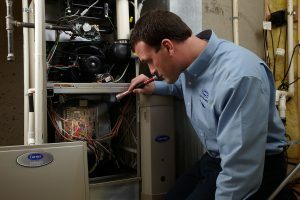 Allow our technicians to inspect your heating equipment. After making our repairs, we will explain what was wrong with your equipment as well as how to keep it in the best condition possible. Unfortunately all furnaces will need to be replaced someday. If your system is completely broken, we can provide you with the HVAC installation service you need. After inspecting your home, we will help you determine the right model. Rather than pressuring you into purchasing the most expensive system, we give you realistic options so you get the most bang for your buck. As your Buford furnace repair and installation experts, we take pride in helping each of our customers. If you need Buford furnace repair, maintenance or installation, look no further than Cool Masters Heating and Air Conditioning. Have any questions, concerns or comments? Give us a call! Our team is here to assist you. Feel free to schedule an appointment with the button on the right of this page!